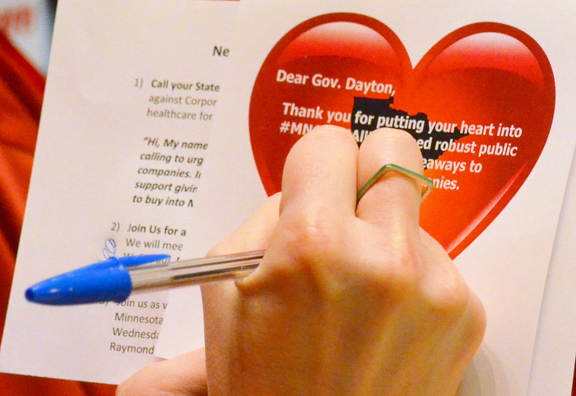 Rally participants signed Valentine’s Day cards to Gov. Dayton urging him to stand against legislation that would bail out insurance companies. Union nurses rallied at the Capitol today with family farmers, small business owners, clergy and other allies in their push to expand health care coverage to all Minnesotans – and hold insurance companies accountable. Members of the Minnesota Nurses Association spent the day talking to state representatives about making health care more accessible and affordable, including a proposal by Gov. Mark Dayton to expand MinnesotaCare and make it an option for all Minnesotans buying individual insurance. Rose Roach, MNA’s executive director, called expansion of the popular, successful insurance program for low-income Minnesotans an “obvious solution that’s been in front of us all along.” It’s preferable, she added, to Republican and industry calls for the state to subsidize a “reinsurance” fund to protect insurers from losses. Insurance companies “want to socialize debts and privatize profits, and they dare to ask us for more,” Roach said. Small business owners, farmers and retirees at the rally took to the podium to vent their frustrations with the individual health insurance market, which saw premiums soar and provider networks shrink dramatically this year. Dayton and state lawmakers agreed last month to provide emergency assistance to consumers, but that’s a one-time fix, Franklin dairy farmer James Kanne said. Kanne would have paid individual premiums of $1,040 per month this year without subsidies. But farm incomes fluctuate, and he said he’s worried next year those subsidies might not be available. 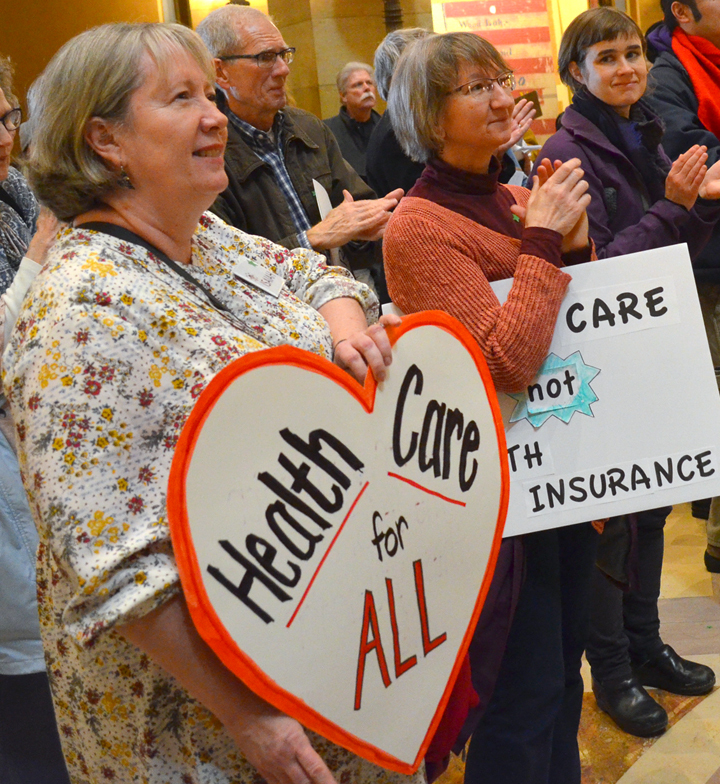 The “ultimate” fix,” Kanne said and other speakers acknowledged, would be a single-payer health system, such as the proposal long advanced by Roseville Sen. John Marty. But with Republicans controlling the Legislature, Marty’s plan is not likely to get a hearing. “That first rung on the ladder (to single payer) is MinnesotaCare as a public option,” Kanne said. MNA’s rally drew support from members three progressive organizations partnering with the union on the health care campaign: the Land Stewardship Project, TakeAction Minnesota and faith-based ISAIAH. I like what I posted!!!!!! !